Pauca sunt haec praesentia tempora. Slight are these present times. Source: The Xanmeti Mravalt’avi 1.13. See Joseph Molitor, Monumenta iberica antiquiora, CSCO 166 (Louvain, 1956), 65-90.
ესრეთ იყვნეს მთასა მას სიმართლით და სიწმიდით. და იყო მუნ მშჳდობაჲ და განსუენებაჲ. Thus were they on the mountain in righteousness and holiness, and there was there peace and rest. Source: The Cave of Treasures § 7.3. See Ciala Kourcikidzé, ed. La caverne des trésors. Version géorgienne. CSCO 526. Scriptores iberici 23 (Peeters, 1993). 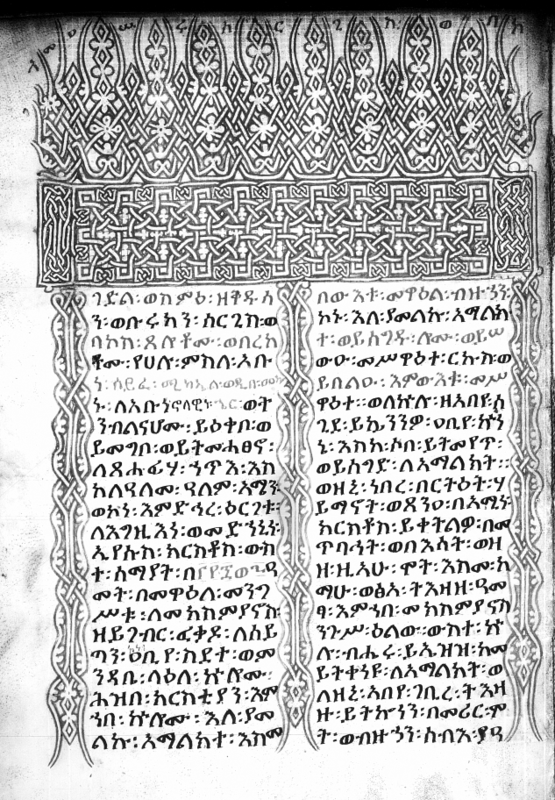 Results of the EMML project, begun in 1973 to photograph mss in Ethiopia, include the availability at HMML of several thousand microfilmed manuscripts in Gǝʿǝz (and Amharic). The first catalog appeared in 1975 at the hands of William Macomber, and he and Getatchew Haile would go on individually or together to produce ten more, with vol. 10 appearing in 1993 and vol. 11 now essentially finished but not yet published. Data from these catalogs are available in Oliver, though in less detail than in the printed catalogs. Later this summer a small conference will take place at HMML to celebrate the 40th anniversary of the project. EMML 141, f. 143v. Barsoma. Based on the printed catalogs of vols. 1-10, here is a list of the manuscripts containing hagiographic materials by sub-genre of hagiography. Many manuscripts are hagiographic collections and thus contain a number, sometimes a great number, of hagiographic texts, while a few of the manuscripts have only an isolated hagiographic work or two. There is naturally some overlap of sub-genre: for example, a martyrdom text may well contain miracles. The counts for each volume given below are based on these separate categories, that is, a few mss are counted more than once if they have texts in more than one category. I have combined the categories of the catalog indices “Acts of Martyrs and Saints” and “Miracles” under one heading here: “Vitae, Martyrdoms, and Miracles”. As mentioned above, the printed catalogs have more detail, but basic information about the hitherto cataloged EMML mss will be found in the online catalog, searchable by EMML no. here. EMML 1479, f. 84v, Gädl of Sergius and Bacchus. The total count comes to 1213. Again, this enumeration by hagiographic genre means that there is some duplication, but even allowing for that, there are around 1000 manuscripts with hagiographic content in the cataloged EMML collection. That’s manuscripts: the number of individual texts is, of course, much greater. With this list, there is no doubt as to the remarkable amount of hagiographic mss available within the EMML project; as to the makeup of these mss and the particular witness of the texts contained in them, it’s a case by case question that has so far been investigated only partly. Needless to say, for students of eastern Christian hagiography and of Gǝʿǝz language and literature, there is much work to do in these manuscripts. See here for the EMML catalogs by Macomber and Getatchew. EA below = Encyclopaedia Aethiopica; in the EA articles full bibliographies will be found. Not listed here, but the articles in EA II on the various homilies (s.vv. “Dǝrsanä PN”) may also be mentioned. Bausi, Alessandro. “Gädlä sämaʿǝtat.” EA II 644-646. Colin, Gérard and Alessandro Bausi. “Sǝnkǝssar.” EA IV 621-623. Getatchew Haile. “Gǝʿǝz literature.” EA II 736-741. Habtemichael Kidane. “Mälkǝʾ.” EA III 700-702. ——–. “Mälkǝʾa gubaʾe.” EA III 704-705. Huntingford, G.W.B. 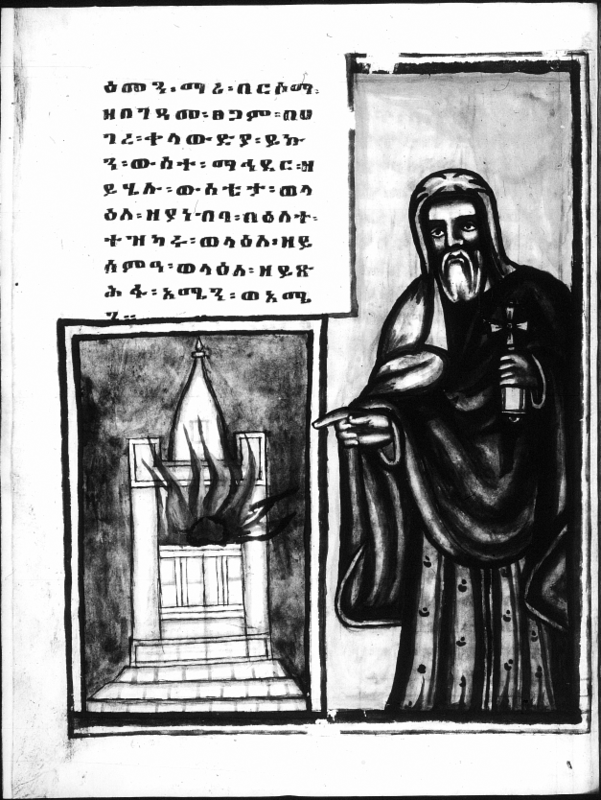 “The saints of mediaeval Ethiopia.” Abba Salama 10 (1979): 257-341. Kaplan, Steven. “Gädl.” EA II 642-644. ——–. “Holy Men.” EA III 58-61. Kinefe Rigb Zelleke. 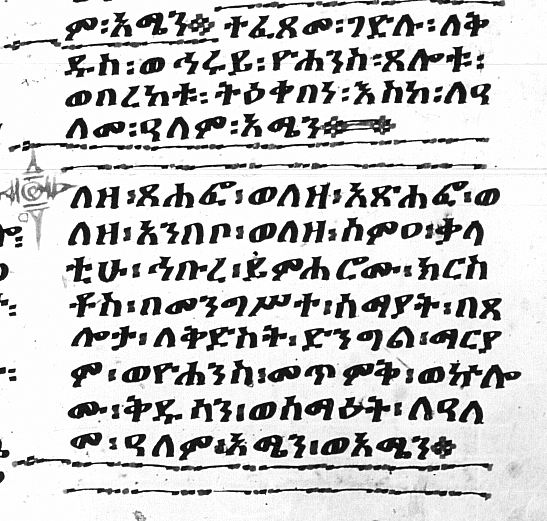 “Bibliography of the Ethiopic Hagiographical Tradition.” Journal of Ethiopian Studies 13 (1975): 57-102. Mersha Alehegne. “Täzkar.” EA IV 881-882. Nosnitsin, Denis. “Hagiography.” EA II 969-972. ——–. “Saints, Christian.” EA IV 476-480. ——–. “Sälam.” EA IV 484. ——–. “Täʾammǝr.” EA IV 787-788. Samuel Yalew. “ʿArke.” EA I 342.